A Heads-Up to Fellow Pet-Owners! The fastest growing major pet food company in the United States, selling dog and cat food has been accused of lying to pet owners. BLUE is a billion dollar brand based on sales at retail and is the #1 brand in the Wholesome Natural market. “Pet-food maker Blue Buffalo will pay $32 million to settle 13 consumer class action suits, the company announced last month. 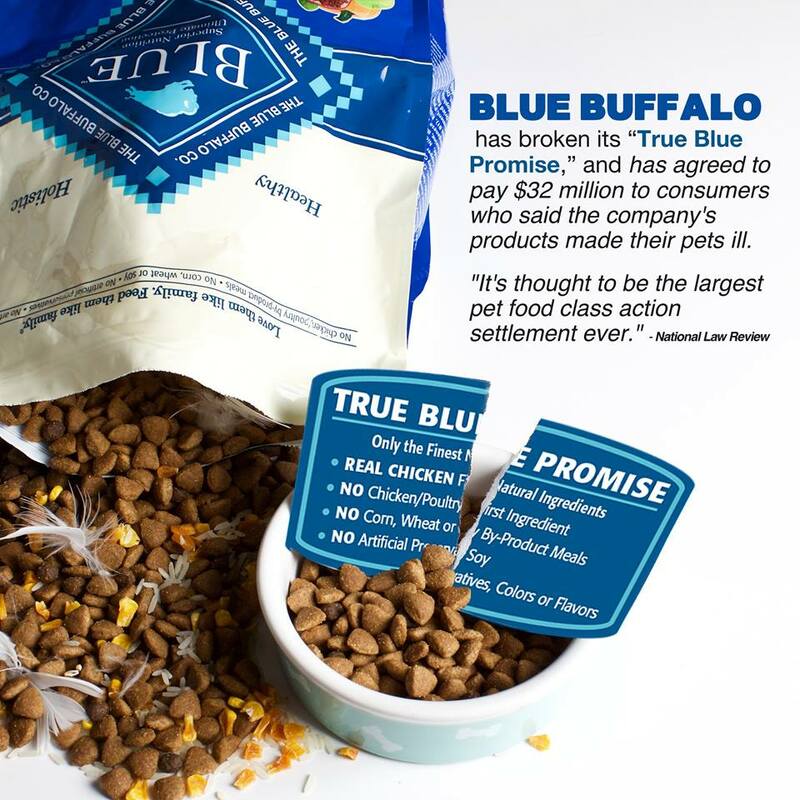 These True Blue Promise claims were allegedly restated on the front and back labels of every Blue Buffalo product and in other Blue Buffalo promotional materials. The class action plaintiffs also asserted that they paid a higher price for Blue Buffalo’s products because of the True Blue Promise. Eric here with DogPerDay. 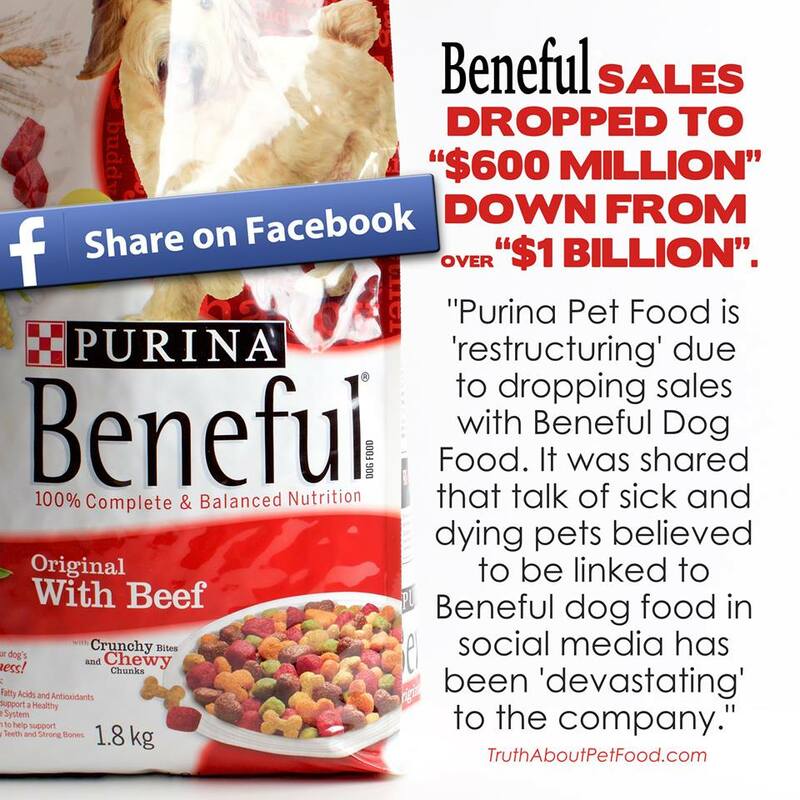 Purina brand dog “food” is pure garbage. No… it’s worse than garbage. Garbage would be healthier. Purina’s so-called “food” is partly made from dead animal by-products. And it isn’t just Purina that does this. Every mainstream pet food manufacturer uses horrible ingredients in their foods. One hidden ingredient in many mainstream brands is ground-up roadkill. Another is euthanized animals. I’m not writing this to just be shocking. Look it up for yourself. And don’t be fooled by brands that sound helpful like “Science Diet.” I’m talking about all popular, mainstream, commerical brands. And also don’t be fooled by deceptive terms like “All Natural.” There are pet food brands that really are All Natural, but the diabolical mainstream companies use the term simply as a marketing ploy. These companies are certainly aware of the “all natural” and “organic food” craze of the past several years, and so they market food as “all natural,” when really there is no care at all as to what goes into their product. Take your dog, cat or other pet off of any mainstream pet “food” right now! Your best friend will thank you… big time! Take a good look at Only Natural Pet Online Pet Store. You will find banners for Only Natural Pet Store all throughout DogPerDay. They have all kinds of non-mainstream, high-quality brands that you should take a look at. And it’s possible to even save money by ordering your dog food online in bulk and having it delivered straight to your door. But whatever you do, get your dog or pet off of mainstream food as soon as possible. While large brands sold in veterinarian’s offices may be marketed as premium, top of the line foods, one look at the ingredients tells a different story. These formulas, made by large conglmorate food manufacturers, derive far more protein from grains or grain by-product sources such as corn gluten meal, brewer’s rice, and wheat, than from healthy meat sources. These brands, and so many like them found in grocery stores, also contain poultry by-product, which consists of the leftovers unfit for human consumption, like feet, beaks, undeveloped eggs, and intestines; everything BUT clean meat. It’s a cheap, low quality source of protein that is far less digestible than clean chicken meal. These ingredients are a tell-tale sign of poor quality food and are no different than discount brands at the grocery store. Although the formulas may contain a few specialized ingredients to position them as a special diet for health conditions such as joint support, urinary tract health, etc., a better way to treat these conditions is with a truly healthy food and one or more daily supplements. This one is very common, even among some veterinarians, but it is most definitely not true. Dogs and cats have very pointed teeth; even their molars are sharp edged, not flat. These teeth are designed to bite, tear, and chew raw meat, so when a dog or cat eats kibble, they either swallow it whole or shatter it. Kibble does not scrape down onto the lower parts of the teeth or near the gums, which is where dental problems start. In fact, kibble can contribute to dental problems when the shattered bits lodge between the teeth, promoting bacterial growth. Just like with your diet, carbohydrate food debris breaks down into sugar, which dental bacteria feeds upon. However, kibble isn’t going to help. Healthy teeth start with a natural diet, healthy chews, and regular brushing. Please see our article, “Dental Healthcare for Your Companion,” for detailed information on caring for your four-legged friend’s teeth. Life stage diets were created as a marketing tool! The more formulas manufacturers develop, the more shelf space they command. While it is true that puppies and kittens need more food for their size than adults, they don’t need a specially formulated puppy or kitten diet. A high-quality, varied diet is the best option for your young pets. For puppies this can include dry food, canned, freeze-dried, dehydrated, and raw food. For kittens, kibble is not recommended to be a large portion of the diet as it can contribute to dehydration, urinary tract issues and less than optimal health over time. Cats are obligate carnivores, meaning they eat mostly meat and very little carbohydrates. High meat, grain-free foods are a good option if you’re supplementing with kibble, but canned, freeze-dried, dehydrated and raw are the best choices. Feeding younger animals more frequent meals, like 3 times per day, is helpful while they are in their biggest growth phase. After three or four months of age, two meals per day is sufficient for most animals. Puppies and kittens should be kept slim, just like adult animals; keep an eye on your little companion’s waistline and don’t let them get round. Senior animals tend to slow down as they age, so while their calorie requirements may shrink, their need for the healthiest food you can provide is never greater. As animals age, they require excellent nutrition to keep their immune system as strong as possible and their joints in good working order. Continuing to feed a high quality, varied diet is the best thing you can do, just feed a little less of it; older dogs and cats are the most susceptible to the many health issues that obesity can contribute to, including diabetes, arthritis, and urinary tract problems. It’s important to note that not all healthy foods for us are healthy for our pets: onions, grapes and raisins can all be toxic to dogs and cats. If you’re not positive it’s safe, don’t feed it. There are a number of homemade pre-mixes available to which all you need to add is meat and an appropriate oil for healthy fat content. Pre-mixes contain vegetables, vitamins and minerals, and sometimes grains to make the meal complete. Sojos has varieties with and without grains. Honest Kitchen offers Honest Kitchen Preference, a grain-free blend. Dr. Harvey’s makes pre-mixes for home cooked food that contains organic grains with an amazing blend of herbs, and also a grain-free pre-mix. You don’t have to cook every meal for your companion to benefit from fresher food: even the occasional homemade dinner is a wonderful healthy treat! Pet food companies have a pretty big interest in perpetuating this myth. Is every meal you eat complete and balanced? Even the most health-conscious among us don’t worry about meeting the proper balance of nutrients at every meal. We know that over the course of the day or week our diet will be fairly complete, so we don’t have to worry about eating exactly what the food pyramid recommends on a daily basis. Many of us take vitamins and supplements to fill in any gaps because even eating a very healthy diet of whole foods may not provide all the vitamins and minerals our body needs to stay healthy. Variety is the key to a healthy diet for dogs and cats as well. If you’re feeding at least 50-60% commercially prepared foods that are designed to be “complete,” then you are well on your way to providing a majority of the balance of nutrients. Adding canned, raw or cooked meats, people food, fresh vegetables or other non-formulated foods to your companion’s meals will boost the overall nutrition of the diet as long as it is not overdone. Providing a daily multi-vitamin adds extra insurance. One caveat here: meat is higher in phosphorus and lower in calcium, so when adding more than 15 – 20% extra meat to your companion’s diet on a regular basis, keep the calcium and phosphorus ratio balanced over time by including raw bones or adding a calcium supplement. The digestive tracts of dogs and cats are very different than those of humans. The human digestive tract is approximately 25 to 28 feet long with a stomach acidity between 1.5 and 2.5, whereas dogs and cats have a much shorter digestive system at an average of 10 to 13 feet for dogs (shorter for cats) with an acidity of less than 1. This means that raw food moves through your pet’s system in less than half the time it would through a human’s system, and the high acidity kills most bacteria. Even if the food was contaminated, it is likely that the microbes would not enter the animal’s bloodstream. Commercially prepared raw food manufacturers take measures to control against the presence of unwanted organisms such as salmonella and e. coli, so if you’re concerned about contamination, frozen raw diets are a good option. If you eat meat, then you are aware of the precautions to take when handling raw meat. The same precautions apply to raw pet food: wash bowls, utensils and your hands after feeding and handling the meat. Keep the meat frozen until two to four days before feeding, and thaw in the refrigerator. Don’t leave the food down for your pet for more than 30-40 minutes, and throw any leftovers away after this time. If you use common sense, feeding raw food is no more difficult or dangerous than any other pet food, and the health benefits are unparalleled. For more information see “All About Raw Food” in our article archives. This myth is a result of poor quality food manufacturers. The truth is that high plant protein diets are hard on your pet’s organs; high animal protein diets aren’t only healthy for your aging pets, but essential. Poor quality, mass produced pet foods are packed with protein from soy and corn. Unfortunately, your dog and cat are unable to properly digest and assimilate these sources of protein. It lets the food manufacturer boost the protein content of the food without actually offering your pet any substantial protein they can use. High plant protein diets can put added strain on your pets because their bodies aren’t designed to process those ingredients. As they try to assimilate protein from these sources, their organs need to start working overtime. When choosing a healthy, high protein diet for your pet, avoid any bags that feature corn or soy as a prominent ingredient (or better yet, avoid them altogether). You want named meat meals (like chicken meal or lamb meal) or quality meat as the primary protein source. This is a sureproof way to make sure your pets are eating the diet nature intended. Concern about ash content in pet foods came about as veterinarians and cat guardians were looking for the cause of Feline Lower Urinary Tract Disease (FLUTD – formerly known as FUS). In the 70”s & 80’s, veterinarians thought ash was a factor in causing crystals in urine. There are, however, a variety of causes and ash is no longer considered a factor in causing FLUTD. The main problem was the formulation of commercial pet foods: most pet foods were creating a more alkaline urine (higher pH) which leads to an increase in struvite crystals. Most dry kibble diets are formulated with a high vegetable and grain content which creates a more alkaline urine. An all meat diet such as a cat would eat in nature creates a more acidic urine. A high protein diet is the best way to maintain a low urinary pH naturally. Cats eating canned diets have fewer problems with FLUTD than those eating primarily dry kibble diets. This is due both to the higher meat content of canned diets as well as the higher moisture content; increased hydration also prevents crystal formation. A frozen raw food diet is ideal for maintaining a lower urinary pH and providing proper hydration. Focusing on low-ash foods will not solve FLUTD problems, but a healthier diet and proper hydration will. A more effective means of preventing FLUTD than stressing about the amount of ash in your companion’s food is focusing on stress reduction for your pet and you. Stress is an often overlooked contributing factor to FLUTD, along with lack of exercise. When our companions are stressed, their immune system are compromised. Furthermore, when you are stressed, your companion is far more likely to be stressed. Flower Essences are an excellent stress reduction and emotional support tool; cats are especially responsive to flower essences and can benefit greatly from their use. There are flower essences designed for every emotional state, so look through the large selection and choose the one or two remedies that best match your companion’s issues. Dosing is as simple as adding a few drops to the water or massaging them onto your pet’s ears or paws. A healthy dog or cat can eat a different food at each meal without issue as long as they are high-quality foods. Holistically minded guardians and veterinarians know that variety is important for several reasons, the most important being to avoid the development of sensitivities to any particular food or protein type. When the same food is fed for many months or years at a time, animals can develop allergies or sensitivities to specific ingredients in the food. Plus, many holistic veterinarians believe that feeding the same food for many years is a contributing factor to inflammatory bowel disease. Variety provides a wider range of nutrition for your companion as well. Even though a food may be formulated to meet AAFCO standards, that does not mean it meets the standards of every dog or cat. As a matter of fact, many foods that meet AAFCO standards cannot be tolerated by our pets due to the heavy use of grains and grain by-products. A diverse diet will meet the nutritional needs of your companion over time, and, besides that, would you want to eat the same meal everyday? Remember, every meal doesn’t need to be perfectly balanced as long as the diet is balanced over the course of a week. Whenever feeding any diet, it’s important to remember to include supplements. Digestive enzymes are hugely important and will help your companion transition from one type of food to another with ease. They help animals maintain a healthy digestive tract and get the most nutrition from their food. Essential fatty acids, especially from fish oil, provide the omega 3 fatty acids missing from most processed pet foods that nourish the skin, coat and digestive tract. Probiotics are important for animals on medication or those experiencing digestive upsets. For animals in need of increased support due to chronic digestive issues, Only Natural Pet GI Support provides herbs and nutrients to soothe and heal the lining of the digestive tract. While there are a few canned formulas available that meet the needs of both species, most foods are designed specifically for cats or dogs. Cats require a higher percentage of protein and fat than most dogs and they have specific requirements for additional taurine. Dogs that eat too much cat food are at risk of weight gain and even pancreatitis. Cats that eat dog food are at risk of weight gain when the food is high in carbohydrates, as well as more likely to develop deficiencies in important amino acids like Taurine. Scritch, scratch, scritch, scratch… it may be the first thing you hear every morning or even wake you up at night – your companion’s itching and scratching. The most common questions from visitors to Only Natural Pet Store are about itching, licking, scratching and skin problems. In this article we will discuss some of the possible causes, and a basic protocol for addressing the most common cause – allergies. Evaluating the history of your companion’s problem is very important in helping your veterinarian determine the cause. Though allergies are the most common cause of itching and licking, there are some diseases that need to be ruled out before embarking on the path of allergy treatment. 1. Where is the animal the itchiest? Face, base of tail, above the hips, neck, belly, feet…. Watch your companion closely and determine his or her worst areas. Flea Allergies typically cause itching above the hips, the base of the tail, groin and thighs on dogs. Cats usually itch around the neck with flea allergies. Airborne and food allergies commonly cause itching around the face, ears, belly and feet. Scabies (Sarcoptic Mange/mites) typically cause lesions and itching around the ears, elbow, belly and hocks. Demodectic Mange generally initially appears in young dogs on the face or forelegs. Cheyletiella (mites) characteristically present on the back or sides. 2. When did it start? How old was the animal? Mange is more common in younger animals. Puppies and kittens are also more susceptible to flea allergies as they have weaker, less developed immune systems. Older or ill animals are also more susceptible due to a weakened immune system. 3. Is the problem seasonal or year round? Seasonal itching is more indicative of flea or inhalant allergies or insect bite. In many cases, an animal will initially show signs of seasonal allergies that progress to year round problems. 5. Have you tried any medications or treatments that helped? Certain causes of itchy skin will respond to steroid treatment better than others. Flea allergies and airborne allergies seem to be more responsive than other causes. 6. Has it been contagious to any other animals or humans in the household? Sarcoptic mange, Cheyletiella and ringworm can be passed on to other animals or humans. Once the cause of the itchy skin is determined, treatment can begin. Any secondary bacterial or yeast infections must be treated, however, before much progress can be seen in remediation of the underlying cause of the itchy skin. Hot spots occur from self-inflicted trauma that results when the pet attempts to relieve a pain or itch by excessive scratching, biting and rubbing. These must be controlled with topical treatments while the animal’s immune system is recovering. A majority of itchy skin is caused by allergies, so that is what we will address here. In addition to itchy skin, other allergy symptoms may be present such as chronic ear infections or respiratory symptoms such as coughing or nasal congestion, and eye discharge. Food allergies may also cause symptoms such as vomiting or diarrhea that can ultimately progress to inflammatory bowel disease. Some holistic veterinarians also believe that seizures, arthritis, asthma and chronic urinary tract infections can be caused or complicated by food allergies. Itchy skin and allergy symptoms such as paw chewing have also been linked to over-vaccination in a large number of cases. Frequently the symptoms will begin within days or weeks of vaccinations. Please educate yourself about vaccinations and the risks involved. A good start would be to read the article titled What You Need to Know About Vaccinations. 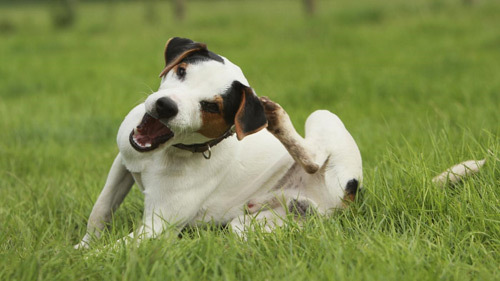 One of the most common causes of itchy skin is fleas and flea allergies. If you suspect fleas, please read The Natural Approach to Flea Control. Flea control is an essential step in the treatment plan for any animal with allergies. Any dog or cat with a compromised immune system is more susceptible to fleas and parasites, so plan to treat the home environment a month BEFORE flea season begins. The last thing your dog or cat needs when already battling allergies is a flea infestation to make things worse! Oatmeal Baths followed by conditioner to seal in moisture can relieve the itch. If more potent topical treatment is necessary, your veterinarian can prescribe topical treatments and/or shampoo to help curb the itchiness. The first dietary supplement to consider for an animal with itchy skin is essential fatty acids (EFAs). Fish oil is considered the best source for cats and dogs, since the fatty acid chains are readily usable by the animal’s system without any conversion process, which is necessary for the utilization of plant-sourced essential fatty acids such as flaxseed. EFAs help reduce inflammation and nourish the skin and coat. They can also be beneficial in assisting the healing process of the digestive system. For older animals, EFAs can help alleviate arthritis symptoms as well. See Essential Fatty Acids for more details. Allergies are essentially the immune system gone awry. The body starts to “attack” itself in response to what it perceives as foreign invaders. Supplements to help modulate the immune system are very helpful in treating allergies. Only Natural Pet offers an excellent variety of immune support supplements to help deal with allergies. The gastrointestinal system is the first line of defense in an animal’s immune system. When a dog or cat has allergies, the gastrointestinal system is often irritated and inflamed. “Leaky gut syndrome” is the result of this chronic irritation, allowing particles that are too large for the system to manage to pass into the bloodstream – this triggers the immune response that manifests as allergies. Antibiotics contribute to the problem by killing the healthy bacteria that aid digestion and maintain a healthy gastrointestinal system. Healing the gut is crucial to the success of allergy treatment. At a minimum, digestive enzymes and probiotics should be added to each meal to aid in the breakdown of food particles, support the restoration of beneficial gut flora and assist the healing of the digestive tract. Animal Essentials Plant Enzymes & Probiotics is a good digestive enzyme product without additional ingredients that may aggravate allergies. For an animal that has been on prescription medications, additional probiotics are important to help the GI tract regain a healthy balance of beneficial bacteria. L-Glutamine is an amino acid essential to the proper function of the gastrointestinal tract. Supplementing with L-Glutamine supports the healing process of the gut and the restoration of healthy gut flora. An excellent choice for supporting the gastrointestinal system is Only Natural Pet GI Support, which is specifically designed as a comprehensive intestinal support supplement for dogs and cats. It combines L-Glutamine with amino acids, probiotics, vitamins and herbs to speed the healing of the lining of the GI tract and support healthy digestive function. For animals showing signs of weight loss, diarrhea and additional symptoms of malabsorption/leaky gut, Seacure by Proper Nutrition provides essential nutrients for the healing process of gastrointestinal and bowel function. Supporting the animal’s organs that filter and eliminate waste is another important step when addressing allergies. The liver, kidneys, gastrointestinal system and lymphatic systems are working hard to eliminate the waste produces by the inflammatory process present in allergic reactions, as well as any toxins from medications, the environment and foods. Using natural cleaners around the house and eliminating pesticide and chemical fertilizer use in the yard can go a long way in helping reduce the load on the animal’s system. A high quality diet, preferably organic, will also reduce the burden of toxin elimination. Detoxification is essential for any animal that has been treated with multiple courses of medications such as steroids, antibiotics or antihistamines. Steroids, especially, are taxing on the animal’s liver. Chinese herbs like Quercenol by Seven Forests, are excellent herbal and nutraceutical complexes for animals with allergy symptoms, particularly those that have been on steroids and other medications. Quercenol has anti-inflammatory and antihistamine properties to help the allergies, as well as herbs to help cleanse and support the liver and build the immune system. Detoxifying formulas like Only Natural Pet Blood & System Herbal Formula or Animals’ Apawthecary Detox Blend are very useful in detoxifying a taxed elimination system. These are easier to give to cats than the Quercenol since they are liquids. The length of time these supplements may be necessary will vary with the severity of the problem and the response of the individual animal. Natural supplements, herbs and remedies are not like prescription medications – they may vary in effectiveness from one animal to the next, and in many instances take time to reach full effectiveness, up to several weeks or more. Herbs and supplements designed to relieve the itchy skin and support skin health are another step in the treatment program for chronic allergies. This can help relieve the stress caused by the discomfort, which is supportive of immune function and healing. In addition, reducing the itch helps in the reduction of secondary infections and allows the skin to heal. Skin Balance by Health Concerns is an excellent herbal complex for the treatment of itchy skin in dogs (the tablets are too large for cats to swallow, and would need to be crushed for use). In Traditional Chinese Medical terms, an animal with an allergic reaction manifesting as itchy skin is suffering from wind (itching), heat (redness), damp (oozing) and blood deficiency (dryness, poor coat) problems. The herbs in Skin Balance reduce inflammation and itching as well as boost skin health and assist in the cleansing of the blood. Certain Chinese herbs like Nature’s Herbs for Pets Itch Relief, are ideal for cats and small dogs. They are a great choice for itch relief and clearing the skin of inflammation and hot spots. Integrative Therapeutics Inflamzyme is an enzyme combination that provides natural antihistamine activity and reduces inflammation. Inflamzyme is an excellent choice if inhalant allergies are suspected and symptoms include respiratory issues such as stuffy sinuses, sneezing or coughing. It is best given between meals. HomeoPet Skin and Itch Relief and Newton Homeopathics Skin Care are homeopathic remedies that may be helpful for some animals. These will be more effective once any residual steroids or medications have been cleared from the system. HomeoPet Hot Spots is similar to the Skin and Itch Relief formula, but contains additional remedies to address the red, inflamed or oozing hot spot areas. Natural treatments do take more time and effort than a course of steroid treatment. The long-term health and well-being of your companion, however, will be far better served by treating the animal’s whole system and the underlying cause of the itch, not just the symptoms. Some cats and dogs become quite distressed by the itching and can benefit from the addition of stress-relieving herbs, supplements, flower essences or homeopathic remedies. Persistence in treating the itchiness topically while you are addressing the underlying causes through diet and supplements will greatly benefit your pet’s ability to heal and reduce his or her stress as well. Secondary infections caused by relentless scratching, licking or biting complicate and slow the healing process, and topical treatment can help prevent this. The information provided here is intended to help you support your companion with mild to moderate allergy-related itching. Bear in mind that the treatment of more severe allergies and itching require veterinary assistance. For help locating a holistic veterinarian in your area try the American Holistic Veterinary Medical Association referral directory. If you cannot find a holistic veterinarian close to you, many of them are available for phone consultations, so it can be helpful to broaden your search to include nearby states in your region.